When we started the Carbon Disclosure Project (now known as CDP) over fifteen years ago, the term disclosure was barely used in relation to climate change. Today, a major effort is underway to establish a global framework for climate-related financial disclosure. What has changed? Disclosure is a word newly prevalent in the climate change discourse. In sum, it means companies measuring and reporting information about their environmental performance and impacts so that investors can better understand its relevance to the future of the business. In the face of unparalleled global challenges - climate change, water scarcity and deforestation - disclosure is a vital first step in managing and reducing environmental impact. And following last December's unprecedented Paris Agreement, signed by over 170 countries last week in New York, business has a critical role to play in the transition to a clean, sustainable economy. CDP, when it first began, consisted of a small group of climate change enthusiasts from the investment and corporate worlds working out of a donated basement with no windows. We had set out to do something that was practically unheard of in capital markets at the time - ask business to provide climate-related disclosures. Some of the investors we approached told us that climate change was simply not an issue for them or their clients. However a group of 35 institutional investors, managing US$4 trillion in assets, agreed that providing information about climate change risks and opportunities was important and became CDP's first signatories to a request for climate disclosure in 2002. Fast forward more than 15 years, and our annual request for information has helped to drive dramatic change in the practice of disclosure and propel ESG investment strategies into the mainstream. Once considered a sustainability add-on, the disclosure of a company's greenhouse gas emissions, climate risk and strategy has become fundamental to the majority of the worlds investors. More than 5,600 companies disclosed environmental data through CDP in 2015, close to 60% of the market capitalisation of the world's largest stock exchanges. This year 827 investors representing US$100 trillion are expecting and demanding that even more companies do so. The glass on climate disclosure is more than half full, the opportunity now is to fill it. By asking companies on an annual basis, and with increasing levels of investor support, to detail their contributions to global warming and their strategies to mitigate the associated risks, CDP disclosure has helped spark the change in how companies think and act on climate. Companies across every industry, including those who once told us it was irrelevant, are embedding climate change targets into their business strategies, paying their staff to help them meet those targets, and in some cases facing shareholder pressure for not having strong enough targets. Over 1,000 companies told us last year they already use or plan to implement an internal price on their carbon emissions - a number unthinkable a few years ago. There is a reason why these companies continue to share their environmental strategies through disclosure: it works. Research from our supply chain program shows that suppliers that have disclosed to CDP for at least the past three years demonstrate a more robust approach to climate management than those disclosing for the first time. Measurement and reporting is leading to better management. The benefits of disclosure don't end there. Environmental disclosure and its impact on financial markets is now a growing area of academic research. New and compelling evidence from the Swiss Finance Institute shows that companies that are transparent about their carbon risks see a positive impact on their firm value. And research from Oxford University shows that companies who disclose their climate impacts through CDP enjoy more favourable lending conditions than their non-disclosing peers. It has been exhilarating to see how the flood of data, which we have helped to drive demand for, is influencing the way investors and asset managers approach low-carbon investment. The biggest money managers in the world are now integrating ESG considerations into every day investment decisions. CDP disclosures feed directly into Bloomberg terminals, and support a plethora of substantial investment products and services. Our data is integral, for example, to the New York State Common Retirement Fund's new US$2 billion low-carbon index compiled by Goldman Sachs, STOXX's new family of low carbon indices and Standard and Poors' more established carbon efficient indices. But climate-savvy investors want more. More disclosure, more detailed and comprehensive information about a company's climate strategy and more transparency. ExxonMobil is among the companies facing investor pressure to disclose. Shareholders with over US$6 trillion in assets are asking the oil major to disclose how resilient its portfolio and strategy would be against tightening climate regulation. The resolution builds on the same successful model of investor engagement championed by the Aiming for A investor coalition, which uses CDP performance bands and sector analysis as a benchmark. As more mainstream investors champion the need for disclosure and more companies identify themselves as environmental stewards, it is becoming clear that we are on the cusp of a new era. 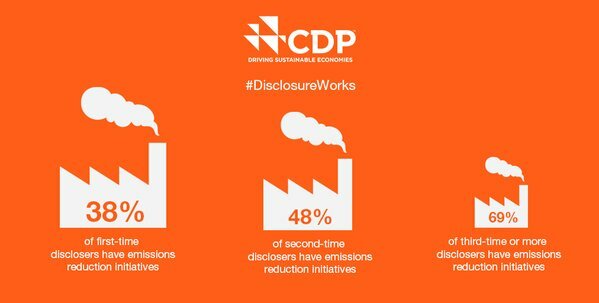 Because of the scale of disclosure CDP has driven, in collaboration with the We Mean Business Coalition we were able to show policymakers at COP21 for example that momentum and willing was already there in the business world to tackle climate change. The scale of progress we have helped to drive will also enable new and valuable initiatives such as the Taskforce on Climate-related Financial Disclosures (TCFD) to stand on our shoulders and, with our support, take disclosure to a whole new level. We are emboldened by the approach the TCFD proposes taking, which is critical for paving the way for regulation to embed climate-related financial disclosure across all G20 nations. At CDP, we have successfully secured disclosure from companies representing nearly 60% of global market capitalization. The principle underpinning our work when we first began remains relevant today: robust reporting is necessary for creating climate resilient financial systems. Disclosure continues to drive everything we do. We know there is still a long way to go, and that unfortunately there are still companies who are not pulling their weight. The Paris Agreement relies on disclosure and transparency, and all companies must play their part. We hope you will join us in the next phase of our work as we help embed climate change and environmental considerations into every business and investment decision, and keep us on track to limit global warming to well below 2 degrees.